Dominated by GE Healthcare, Schiller, and Koninklijke Philips N.V., the global cardiac Holter monitor market features a largely consolidated competitive landscape, notes a recent market study by Transparency Market Research (TMR). These companies collectively accounted for a share of almost 48% in the overall market in 2015 backed by a strong product portfolio and strategic presence in high-growth regions. Furthermore, mergers and acquisitions and strategic partnerships are the focus of players in the market to add value to their R&D activities. The global cardiac Holter monitor market is valued at US$293.8 mn in 2015 and in anticipated to be worth US$518.9 mn by 2024 at a CAGR of 6.6% from 2016 and 2024 due to an increasing rate of cardiovascular diseases across the world. In terms of product, 1-channel, 3-channel, 2-hannel, and 12-channel are the segments of the market. Amongst these, 3-channel product segment is expected to emerge as the leading segment displaying a CAGR of 6.8% between 2016 and 2024. This is due to the efficiency of 3-channel devices for interpreting and discovering cardiac arrhythmia and atrial fibrillation. Geography-wise, North America is expected to be the leading regional market for cardiac Holter monitor until the end of the forecast period in 2024. 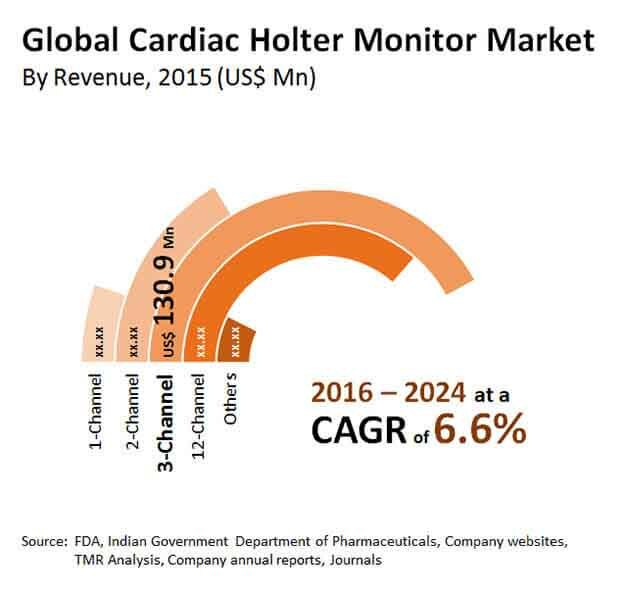 In this region, high incidence of cardiac arrhythmia and atrial fibrillation and use of ultramodern diagnostic devices will contribute to the growth of cardiac Holter monitor market. Moreover, huge investments made top players in medical devices industry will also favor the growth of this regional market. “Asia Pacific is also expected to display substantial growth in the cardiac Holter monitor market over the forecast period,” says analyst. In the last decade, changes in diet and sedentary lifestyle have been the major reasons assessed for lifestyle diseases among individuals. This includes excessive smoking, excessive alcohol intake and consuming unhealthy foods that have been major reasons for faltering health conditions of individuals, especially related to the heart. Thus, the increasing incidence of cardiovascular diseases has led to the increased demand for cardiac Holter monitors predominantly in ambulatory surgical centers for recording electrical activities of the heart. Besides this, introduction of technologically advanced devices that are easy to be moved is further aiding the market’s growth. Across the world, modernization of healthcare system wherein technology is extensively used and uptake of new cardiac monitoring devices has also augmented the growth of cardiac Holter monitor market. In addition, several governments around the world are spending large amounts on treatment and management of cardiac diseases, thereby aiding the market’s growth. Governmental funding offered to research institutes and hospitals for development of improved treatment and improved management of cardiac diseases is expected to boost the demand for cardiac Holter monitors. The rising preference for minimally invasive surgeries to reduce hospital stay and for fewer chances of surgical complications have bolstered the demand for ambulatory ECG monitoring systems, which in turn has benefitted the cardiac Holter monitor market. Incorrect recording of heart rhythms due to vigorous movements by the patient, poor adhesiveness of electrodes, and unfastening of electrodes has hit the demand for cardiac Holter monitors. Lack of trained personnel for operating cardiac Holter monitor devices has also limited their usage for recording cardiac rhythms. This factor is particularly restraining the market’s growth in developing countries.